I’m sitting here trying to come up with something witty or at least interesting to mark this momentous occasion of having one more of my novels released into the world, but all I can think of to say is, “Hallelujah! Let’s Party!” Please help yourself to some champagne. I promise it’s the best pretend champagne money can’t buy. The fun, however, is real. For those of you who like action games, here is: Book Invasion. For those of you who like more cerebral games, here is: Memory by the Book. For those of you who like card games, here is: Daughter Am I Solitaire. For those of you who like jigsaw puzzles, you will love these! Click on a cover to work a puzzle. They are in order of complexity from the easiest to the I-dare-you-to-solve-it. And that’s not the end of the fun! There’s more! 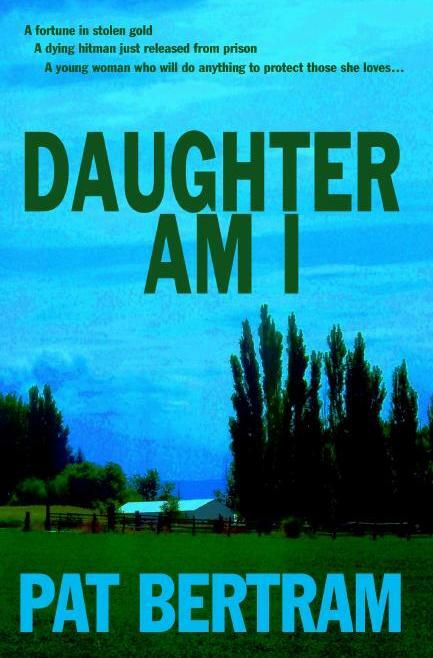 Read the first chapter of Daughter Am I. Click here to find the chapter. Read the first 30% of Daughter Am I free at Smashwords or buy in any ebook format, including Kindle. Click here to find Smashwords. Congratulations, Pat! Say, is there a place where I can see a larger image of the cover? It looks great! Trish, I am so glad you could make it!! It’s always nice to reconnect with an old friend. Oddly enough, we share the same hope — that millions of people will buy Daughter Am I. How wonderful! Congratulations! I must say, Pat. You’re spoiling us with your expensive cake and champagne. Anne, only the best for my once and future fans! Well done, Pat! Enjoy your party and may the Royalties pile up! Carole, that would be wonderful, wouldn’t it? Have a great day. Must desist form the lovely grub as I am trying to get things ready for a live interview with BBC Radio tomorrow then a booksigning in Manchester on Saturday. Hope the launch goes better than mine did! The sponsors forgot to tell the venue, so no posters and few folk!!! Brian, oh my gosh. The things writers have to deal with! Best of luck at bot your interview and booksigning. At least here at my party, virtually nothing can go wrong. Congratulations!! I’m doing the happy dance with you! I’m at the 2009 Muse Online Writer’s Conference right now, but will pop in when I can. I hope you have hot tea and chocolate chip cookies there. It’s kind of cold here & I love chocolate chip cookies! See you later! Deb, hot tea and chocolate chip cookies are here for you. Don’t wait too long, you don’t want them to get cold! I’m finally here & I hope the hot tea & chocolate chip cookies aren’t too cold. I am at the 2009 Muse Online Writer’s Conference this week. That’s why I’m late. LET’S PARTY!! Thank you, Marwa Ayad. I hope you stay awhile and play a game or two. I would like to share my congratulations in the form of a very tasteful and classy e-card (and, if you believe that, you know nothing about me). Congratulations! What a wonderful idea, a cyber party! Have a great time and I’ll be checking in on the fun! Thanks for inviting me! Congratulations, Pat! What a thrill! Read your first chapter & I’m impressed! Susan, wow! Thank you. I am so glad you liked the first chapter. Congratulations. Not only can you write, you really know how to throw a hell of a party. I’ll probably wake up in the morning with a virtual hangover. Marshall! I am so pleased you came to my party! We might end up with virtual hangovers, but it’s so worth it. Even better, no cleaning up after all the guests leave. BevE, Thank you! I hope you stayed around long enough to play a game or two. Muy bien hecho! Good for you Pat! All days should start with good news like this! I look forward to giving it a read and thanks for the booze and cake! 6AM and I’m already tipsy. It’s gonna be a great day! Paul, you’re right. It is a great day! Thank you so much for coming to my party. Congratulations, Pat. I’ll see you in a few days to talk quests and gangsters. Malcolm, I am looking forward to our discussion! I sure hope Amazon puts Daughter Am I on my author page by then, because that’s the buy link I gave you. I also hope the cover shows up soon, too. I feel as if, even though the book has been released, they are still holding the cover hostage. Congratulations, Pat! It’s a wonderful accomplishment. Congrats. The story sounds very compelling. This virtual bottle of wine is on me. Eva, thank you for the wine. There’s no such thing as a too-spirited party! Good job, Pat! I look forward to reading it. Thank you! I look forward to your reading the book, too. I hope you like it. Thank you, Tracey. I’m glad you stopped by. CONGRATULATIONS!!! Best of luck to you!!! Thanks, Gracen. Luck plays so much a part in the success of a book, so I need all the luck I can get. Great party! Congratulations on getting your newest baby out into the world! Love all the games and the food too. Hi, Wanda! Yep, my latest baby is out in the world. I hope you like Daughter Am I as much as you liked A Spark of Heavenly Fire and More Deaths Than One. Fabulous party, and hey, with virtual cake and champagne there are no calories or hangovers. A.F., It’s always good to see you. I hope you hang around and play a game or two. WOO HOO! Congratulations, Pat!!! I so happy for you! Thanks for the virtual party — many fewer calories than the real ones! I’m drinking a toast to DeForest Kelley. My ‘m finger forgot to do its thing, is all… My mind was going faster’n my digits! Congratulations, Pat! I wish the very best for DAUGHTER AM I. So pleased to be able to party with you. Hi, Deborah! And I’m pleased you stopped by to party. Congratulations on your new release too! I love Staccato is a wonderful thriller. Congrats, Pat! I’ll be sure to drink plenty of virtual (and real) champagne to help you celebrate! Dana, I’m clicking glasses with you. Did you hear the resonation? Only the best crystal for you! Pat, heartfelt congratulations on the new book. I will be buying it today from Amazon. BTW-the crepes are delicious, thank you! I’ll have another drop of that French white before I head back to the office. Hi, Donna! I hope you enjoy reading the book as much as I enjoyed writing it. And the crepes are delicious! I hired the very best virtual chef. Congratulations and all the best luck to you! You did a fabulous job with all these contests and things. Kudos to you! Robin, I hope you took the time to play a game or work a puzzle — I made them as thank you gifts for all of you. I finished a Daughter Am I puzzle in 5 minutes and 17 seconds! YAY for me. Once again, a big Congratulation to you!!! Bobby, I am looking forward to being a guest on your blog on the 1st of November. It will be a great interview, so I hope people will stop by. Wishing you many sales! Congratulations! Thank you, Janice. What a strange coincidence — that’s my wish too! Woohoo!! Yippee!! Congratulations and high fives! The cover is great, sounds like a good read, and your on-line party looks fun. The best to you in marketing your new book. Heidi, thank you. Marketing is the hard part. If no one knows about the book, how will they know to buy it! Brilliant news! I’m so glad to see you partying to celebrate. The book sounds like a corker. Annie, speaking of corkers, be sure to have a drink. There’s plenty for everyone! Eat, drink, have fun. You can even be merry if you wish. The good best thing about a cyber party is the food has no calories, the drink doesn’t give you a hangover, and there is always plenty to go around. Hey Sista!!! SO thrilled for you, this is fantastic news! Wishing you the very best of success with this latest book. For this fun and fabulous party, I have feigned my arrival by fantasy ferryboat, festooned in fake fur and faux pearls. GREAT party! Congrats God’s favor and blessing on your story! Be sure to check out the card Toni sent me! I like the cover too. Very serendipitous, in that I was just playing around with a photo retouching program and ended up with it. Wait till you see the printed cover — it printed up darker and so turned out to be a gorgeous deep turquoise, much better than I could ever have hoped. If it’s as good as your other two books I’m sure I’ll love Daughter Am I. Congrats and thanks for the party! Mickey, that you for coming to my party. I hope you like the book as much as you did the first two. Congratulations to you!! Your virtual cake is delicious! I wish you all the success in the world and top billing on the New York Times Bestseller List! J.B. — ah, the New York Times Bestseller List. How wonderful that would be! Thank you, Dellani. I need all the luck I can get! Congrats! I know you’ll do well. And I can’t wait to read it! Thank you, Eleanor. I can’t wait for you to read it, too. I’m curious as to what people will think about the story. Congratulations! I love the cover. Fun games! Good party! Hi, Sherrie. It’s great to see so many Second Wind authors here. Good luck to all of us! Of course you’re welcome, Ray. What’s a few felonies between friends? At least that’s what my characters think. I collected quite a motley crew — a con man, a forger, a hit man, an enforcer, a wheelman and a few others — but heck, they’re all in their eighties, so most have outgrown their bad habits. Sort of. Thomma, so pleased to see you. I hope you get a chance to read Daughter Am I, and I hope you like it. Hi Pat, and congratulations. I just saw the reminder on Twitter as I logged on after cleaning and shopping. Partying sounds much more fun. Hey, cool! Twitter really does work! I am so pleased you came, Sheila. Just think, in a short while we will be celebrating the release of the Second Wind Murder anthology with your short story in it! We’ll have to think of something special to do for a party. Cool. I’m really looking forward to it. Amy, brave soul. I haven’t even tried that hard one! I’ve never seen puzzle pieces like that. I am convinced they all were not there. Solitaire was much more my speed. Great party! The puzzle pieces have a way of hiding behind other pieces. You have to click on various pieces to see if another piece is lurking underneath. Congratulations Pat! Best of luck with the book. I’m pleased you stopped by, Eric. It won’t be long before I’ll be congratulating you on the release of your book! Ah, should have been cooking dinner… 32min51sec, 117 pieces. Fun puzzle. Fun party Pat. Thanks. Congratulations! I hope to become a successful publisher like yourself one day! Once again, congrats!!! Sharon, I hope you do, too! Congrats Pat on your book being published. It is always a happy ocassion when a publisher sees what you see in a book. Enjoy your happy day!!!! Rita, I was very lucky to find my publisher, and yes, it was a happy occasion! Daughter Am I sounds like a wonderful read! Thank you, Maggie. I hope people enjoy the book. Well, I missed the party because I had to work earlier this evening, but it looks like everyone had a grand time! Congratulations on your new book, Pat! LuAnn, you didn’t miss the party. I’m still here, and the puzzles are still available for people to play with, and the samplers are still available for download. Congrats, Pat! Couldn’t have happened to a nicer person! Congratulations on your release, Pat! The story sounds intriguing. Wishing you many sales! Congratulations on the release of your novel. As we say in New Orleans, Laissez les bon temps roulez! Wow – so many comments – kudos to you! Wow, what a great turn-out for your party. Wonderful first chapter–I want to keep reading! Many congrats for huge sales.